1. Place the water in a large saucepan; bring to a boil. Add 4 lime leaves, garlic and chicken, reduce heat;simmer covered for about 15 minutes or until chicken is cooked through. Cool chicken in liquid for 15 minutes. Slice chicken thinly;reserve. Strain stock through muslin lined sieve (I just use a sieve like a large tea strainer) in a large bowl;discard solids. allow stock to cool;skim fat from surface. 2. Cook laksa paste in large saucepan, stirring, until fragrant. Stir in stock, coconut milk, chilli and remaining torn lime leaves; bring to a boil. Reduce heat;simmer, uncovered for 20 minutes. 3. Meanwhile, place rice stick noodles in a large heatproof bowl, cover with boiling water, stand until just tender;drain. Place Singapore noodles in separate bowl cover with boiling water, separate with a fork, drain. Divide both noodles among serving bowls. 4. Stir sugar, juice, sauce, tofu and chicken into laksa. 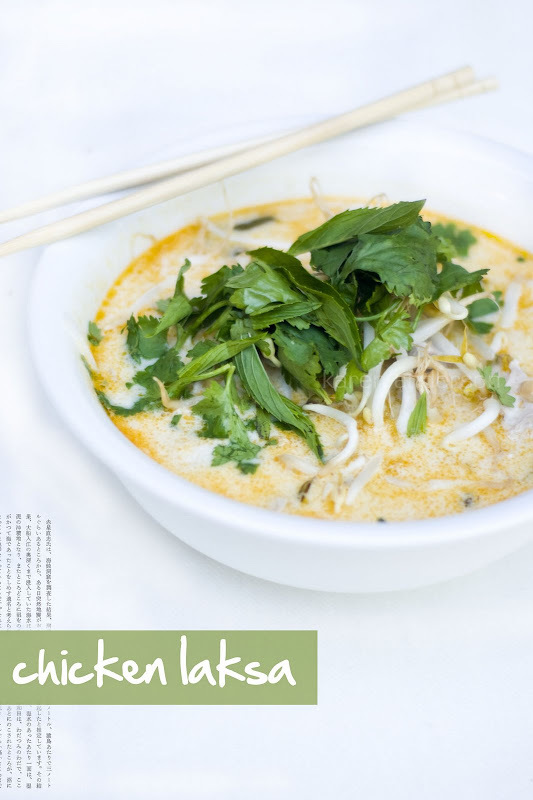 Ladle laksa over noodles; sprinkle with sprouts and herbs. Serves 4 ... we are 2 adults and 3 kids and it does us well. I love that photo so much. I am drooling here! Oh for some Laksa... You have to make this for the imaginary day sometime in the future when we are in the same country again and we visit you! I love the ratings system! Also, is it meant to be 1/2 CUP of laksa paste - there is nothing there. Just checking... Plus, for our US friends (and elsewhere probably) coriander is also known as cilantro.